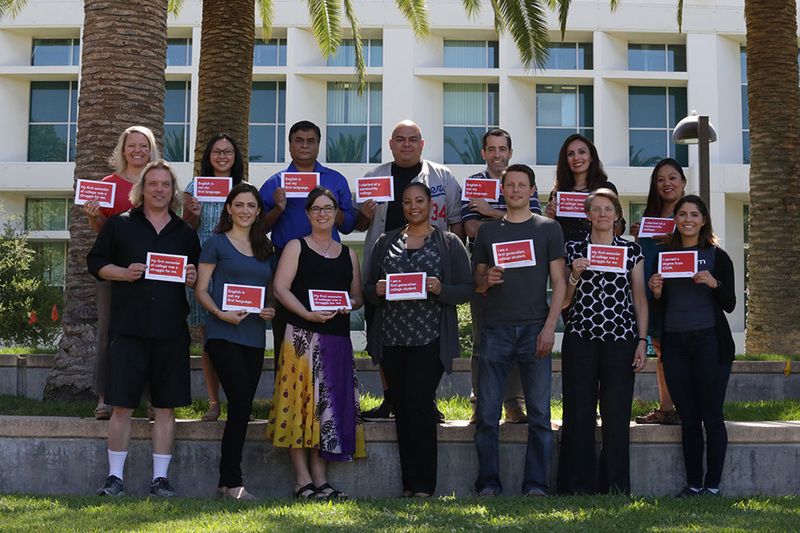 Faculty and staff hold up their CSUN Connects placards. Photo courtesy of Kristy Michaud. The Office of Student Success Innovations (OSSI) has teamed up with multiple departments at California State University, Northridge to launch a new initiative called CSUN Connects. Kristy Michaud, who directs the initiative, said that the project aims to unite CSUN faculty, staff and students. “CSUN Connects is a project that we created with the purpose of trying to get faculty, students and staff to connect around experiences they have in common,” Michaud said. “The idea was to get [faculty and staff] to either have in their email signature, in their syllabus, on their Canvas page or on their door or desk, some kind of statement that expressed an experience they’ve had,” she added. Another objective of the project is to “[know that] faculty and staff have similar experiences to that of students, [which] helps the students’ sense of belonging and boosts retention rates,” said Elizabeth Adams, associate vice president for student success. CSUN Connects is open to every Matador. The project launched in March, and a few months in, mostly faculty and staff are printing out and using the placards, but OSSI staff said they hope students will start downloading placards during the summer term. To get the placards, learn more about CSUN Connects or make suggestions for other experiences, please visit the CSUN Connects website.